The Infiniium DSO8064A provides unmatched acquisition performance with up to 128 Mpts of deep memory mapped to a high-definition display, powered by next-generation MegaZoom technology. 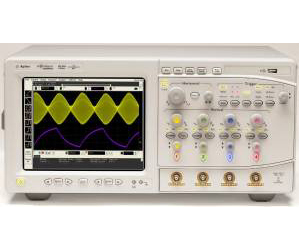 See signal details never before uncovered by a traditional digital storage oscilloscope (DSO). A full application analysis software suite complements the already extensive built-in signal analysis features of Infiniium, built on an open Windows® XP Pro architecture. No longer are you forced to trade off superior signal viewing for advanced waveform analysis. With the Infiniium 8000 Series, you can have it all—deepest memory acquisition with fast waveform update rates, a high-definition display system, and a powerful suite of application solutions.